Another very enjoyable trip exploring the battlefields of the Somme with my brother; we also spent some time at Ypres. Some more posts to follow, but this is the usual one on some of the items we stumbled across while on our walks. A 4" or 6" British HE shell. Lower image shows a transit plug for such shells. It would have been screwed into the top while the shell was being transported, the fuse only screwed in when preparing it for firing. A pair of British wire cutters. A collection of bullets etc found in a small area of a field at Serre. Of interest is the large belt buckle on the far right of the image, circled in red - a pre-war French buckle dated 1870. Would have been lost by a French soldier in the fierce fighting around Serre in 1914-15 before the British took over the line. The detonator from a Mills hand grenade, still in remarkably good condition and probably capable of taking off your fingers! A British 18pdr HE shell placed in the fork of a tree branch by someone (not us!). A larger than usual German screw picket. A dump of shells near Gommecourt. British 18pdr shell on the D6 roadside. Two images of a Camps Coffee bottle. This is a Scottish product, which was first manufactured in 1876 by Paterson & Sons. A brown liquid which contains water, sugar, coffee essence and chicory essence and used as a substitute for coffee by mixing with warm milk. Apparently it was originally conceived as a method of quickly brewing up coffee for military use. Found in fields by Guillemont. Lee Enfield rifle oil bottle. 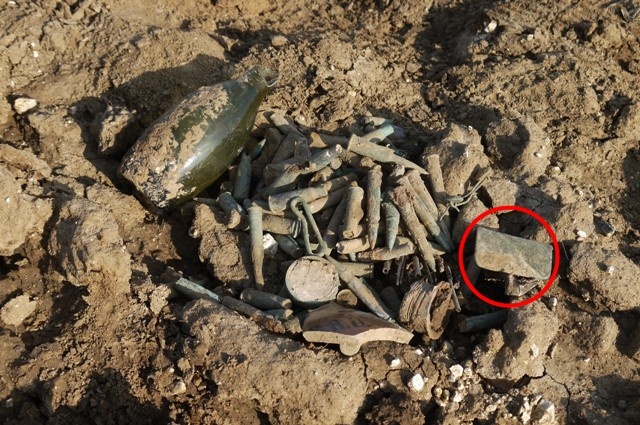 The second relatively complete bottle found at Guillemont. This one was for Henderson's Relish, which is still going and known locally as Hendies or Endersons. It is a spicy and fruity condiment similar in appearance to Worcestershire Source but contains no anchovies. It was first manufactured by Henry Henderson at Sheffield in the latter part of the 19 century. The company was bought by Shaws of Huddersfield in 1910. In 1940, Charles Hinksman formed the present company of Henderson's (Sheffield) Ltd.
Remains of a spade - these are a frequent find, but what is nice about this one is the shell splinter or bullet damage. Stokes 3" mortar round and 18pdr shell cases. The first of two relic British Lee Enfield rifles, this one found near AIF Burial Ground, Gueudecourt. A German 77mm shell run over by a tractor. The second relic Lee Enfield rifle, found near High Wood. Remains of a British water bottle. A German 77mm shell half buried. Remains of a German stick grenade. The wooden filler, used to fill the reduced space required for the explosive charge as the explosive improved during the war, requiring less for the same effect, can still be seen. A British screw picket, which are still widely used in livestock fencing!